The 35-year-old Willingham (36 in February) was a late bloomer who didn’t become an MLB regular until his age-27 season with the Marlins. However, once he established himself as a presence in their lineup, he quickly became known for his excellent plate discipline and plus right-handed power. He found himself traded to the Nationals and then to the A’s before reaching free agency for the first time, where he ultimately signed a three-year, $21MM contract with the Twins. Willingham’s best season came in his first year with the Twins, as he batted .260/.366/.524 with a career-high 35 home runs — earning him a Silver Slugger and making him just the third player in Twins franchise history to hit 35 or more homers in a season (along with Hall of Famer Harmon Killebrew and former AL Rookie of the Year Bob Allison). In total, Willingham’s career comes to a close with a .253/.358/.465 batting line, 195 homers and 632 RBIs in 1147 games between the Marlins, Nationals, A’s, Twins and Royals. The “Hammer” earned more than $35MM in his playing career, according to Baseball-Reference.com. MLBTR wishes Willingham and his family luck and happiness in his post-playing days and congratulates him on a very nice career. Though not available to MLB clubs at present, righty Chihiro Kaneko could become a virtual free agent (in the same manner as Masahiro Tanaka last year) if he is posted by the Orix Buffaloes. The 31-year-old has signed on with agent Arn Tellem of Wasserman, according to a tweet from Liz Mullen of Sports Business Journal. While we wait to see whether Kaneko shakes up the market, let’s look at the latest of one top arm who is already free to sign with any club. The Marlins still have ongoing interest in James Shields, according to a tweet from Ken Rosenthal of FOX Sports. Meanwhile, Rosenthal writes that the Diamondbacks at least like Shields, though it remains from clear that the club will be able to clear the salary it needs to make a legitimate run at him. As these reports would indicate, and Rosenthal notes, the market is quiet right now for the veteran righty. The Cubs are among five teams to have shown legitimate interest in outfielder Jonny Gomes, according to Rob Bradford of WEEI.com (Twitter links). The right-handed-hitting Gomes, 33, will surely market himself as a bench or platoon bat in the corner outfield. Though he had a rather rough go of things in 2014, he still managed a .743 OPS against lefties. Fellow lefty-masher Josh Willingham has yet to decide whether he’ll play, agent Matt Sosnick tells Jon Morosi of FOX Sports (via Twitter). Willingham, 35, will surely be intrigued by the possibility of entering a market that just paid Michael Cuddyer $21MM over two years (along with the sacrifice of draft compensation). As we continue ticking through the veteran outfielders, the Royals and Twins are the clubs most aggressively courting outfielder Torii Hunter, Chris Cotillo of SB Nation tweets. That comes as little surprise, as those AL Central rivals have long been said to be competitors for Hunter, whose market is now wide open with the Tigers saying they do not expect to bring him back. 5:57pm: Willingham says that he has yet to decide whether or not he will play next year, as Berardino tweets. Willingham has been slowed by a groin injury for much of September, which comes just months after he missed nearly two months with a fractured wrist (suffered when he was hit by a pitch) and a year after he missed a large chunk of the 2013 season with a torn meniscus. Willingham inked a three-year, $21MM contract with the Twins in the 2011-12 offseason and proceeded to have a career year, mashing 35 homers and posting a very strong .260/.366/.524 batting line in 2012, despite playing in the pitcher-friendly confines of Minneapolis’ Target Field. However, since that time he’s batted .212/.345/.382 as he’s battled those injuries. Minnesota flipped him to the division-rival Royals in exchange for pitching prospect Jason Adam in August. A late bloomer, Willingham didn’t make his Major League debut until age 25 and didn’t see more than 29 plate appearances in a season until his age-27 campaign with the Marlins. However, he quickly established himself as an on-base machine and a power threat, as he posted an OPS+ and wRC+ of at least 100 (league average) or better in each season from 2006-14 (with the exception of an OPS+ of 96 last year). In total, Willingham has put together a .253/.359/.465 batting line with 195 home runs in his Major League career. 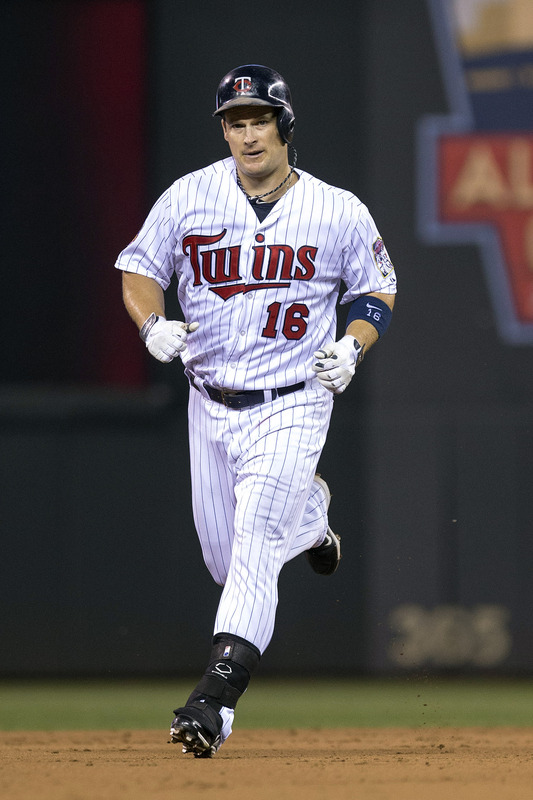 As Berardino notes, his 35-homer campaign in 2012 makes him one of just three players in Twins franchise history with a 35-homer season, joining late Hall of Famer Harmon Killebrew and 1959 Rookie of the Year Bob Allison. With the Royals almost certainly ticketed for the playoffs, Willingham is set to make the first postseason appearance of his 11-year big league career in October. He’s earned $35.6MM as a Major Leaguer, per Baseball-Reference.com. Corey Kluber’s emergence as the Indians’ ace began on a rainy day with Triple-A Columbus in 2011, MLB.com’s Jordan Bastian writes in a close at why Kluber has been so successful this season. That day in 2011 is when Kluber began experimenting with his two-seam sinker, which has since become the pitch that allows him to set up his cutter and curveball. Kluber also adds that he’s gotten much better at commanding his cutter this season. Here are more notes on the Indians. The four-year, $25MM extension to which the Indians signed Michael Brantley in February now looks like a bargain, Fangraphs’ Jeff Sullivan writes in a piece for FOX Sports. Brantley has broken out in a big way, hitting .322/.380/.512 while producing 4.8 fWAR this season. Sullivan points out that Brantley’s offensive improvement this season has been bigger than any player’s except that of the Reds’ Devin Mesoraco. Brantley has increased his power while reducing strikeouts, and that’s a good combination for a player who already hit for a good average. Sullivan explains that Brantley’s increase in power has partially been the result of him being more of a pull hitter against fastballs. He’s also swinging at more strikes than he used to. The Indians are on the fringes of the playoff race, but they decided they didn’t want Josh Willingham, Terry Pluto of the Plain Dealer writes. The Twins ended up trading Willingham to the Royals. Cleveland offered Willingham a two-year deal prior to the 2012 season, but he ended up taking three from Minnesota. Willingham was very productive in the first season of that deal, but the Indians may have had a point about that third year — Willingham’s production has slipped since 2012. Twins GM Terry Ryan was on-hand in New Britain tonight to see top prospect Byron Buxton’s Double-A debut, but the evening took a scary turn for the five-tool center fielder. Buxton collided with right fielder Mike Kvasnicka and was unconscious on the field for roughly 10 minutes before being driven away in an ambulance and has been diagnosed with a concussion, Ryan said on the MiLBtv broadcast (Twitter links via MiLB.com’s Ash Marshall). It’s been a lost season for the consensus top prospect in baseball, who had already missed much of the season with wrist injuries. Ryan notes that the injury could have been much worse, and reports indicate that Kvasnicka, a Minnesota native whom the Twins acquired from the Astros in minor trade last season, was able to walk off the field (though he, too, was taken to the hospital as a precaution). Recently acquired left-hander Tommy Milone tells Mike Berardino of the St. Paul Pioneer Press that he isn’t worried about the fact that the Twins may have stashed him in the minor leagues for a week in order to delay his free agency by a season. Milone will finish the year just shy of three full years of service time but said, “…as long as I’m here, I’m happy. You never know what’s going to happen four years from now.” As Berardino points out, Milone will still qualify for arbitration this offseason as a Super Two player, which lessens the sting a bit. Berardino notes that both Travis Wood and Ivan Nova had comparable ERAs and innings totals to Milone heading into arbitration, and the duo received first-time salaries of $3.9MM and $3.3MM, respectively. Berardino also summarizes the Twins’ trades to this point, noting that the club saved approximately $7.93MM by trading Kendrys Morales, Kevin Correia and Josh Willingham. He also has a third piece noting that Kurt Suzuki is on pace to earn all $500K of his playing time bonuses after already receiving a $25K bonus for making the All-Star team. That would boost his salary from $2.75MM to $3.275MM. Speaking of Willingham, Paul Hoynes of the Cleveland Plain Dealer runs down some reasons that the Indians neglected to claim the former Twin on waivers — a decision that resulted in the division-rival Royals landing him. The Indians, who had interest in Willingham as a free agent back in 2011-12 and recently lost David Murphy and Nick Swisher to the DL, didn’t want to pay the remaining $2MM on Willingham’s contract. They also were hesitant about his injury history and didn’t want to block playing time from younger players. The Royals have acquired Josh Willingham from the Twins, according to Darren Wolfson of 1500 ESPN (on Twitter). The Twins will receive right-hander Jason Adam, per Andy McCullough of the Kansas City Star (Twitter link). Willingham was claimed by Kansas City off revocable waivers, tweets Mike Berardino of the St. Paul Pioneer Press. The veteran outfielder is owed $1.836MM for the last 48 days of the season, Berardino further tweets. The right-handed hitter, 35, is set to reach free agency following the season and will therefore be a pure rental for the Royals. He has posted a .210/.345/.402 slash with 12 home runs through 278 plate appearances on the season after spending time on the DL early on. His production has not matched up to his high-level numbers over 2006-12 (.847 OPS), but they are a step up over a disappointing 2013 campaign. Willingham brings some much-needed pop to a Royals lineup that has struggled to score runs at times. He is expected to see many of his plate appearances out of the designated hitter spot, per a tweet from Andy McCullough of the Kansas City Star, sharing time with the lefty-swinging Raul Ibanez. Of course, Willingham is also capable of playing the corner outfield, though he has historically been regarded as a well-below-average performer on the field. The return for Willingham is not insignificant, which is a fair achievement for Minnesota given that the pending free agent was claimed (leaving the Twins without leverage to deal with multiple trade partners). Adam, 23, was a fifth-round pick in 2010. He has scuffled somewhat in the upper minors as a starter (5.13 ERA in 242 1/3 Double-A innings), but has had some success at Triple-A this year in a relief role (2.35 ERA over 15 1/3 frames). Baseball America rated him Kansas City’s 9th-best prospect coming into the year, saying he has a solid heater and average slider but will need to develop a go-to third offering (change or curve) in order to succeed against lefties at the next level. MLB.com also rated him in the ninth slot among KC prospects entering the year, but dropped him to 16th in its mid-season update. Ultimately, Adam represents a controllable depth piece for a Minnesota club that already picked up young starter Tommy Milone earlier this summer. The Yankees are still considering names like Josh Willingham, Chris Denorfia and Byrd, but their talks are currently at an impasse, tweets Rosenthal. The Yankees appear to be taking their decision down to the wire. The Yankees aren’t focusing on any major trades, tweets Joel Sherman of the New York Post. They’re looking for an upgrade over Ichiro Suzuki in right field — Marlon Byrd is still possible, he notes — as well as some help for the bullpen. The Nationals have called the Mets to express interest in Daniel Murphy, tweets Ken Rosenthal of FOX Sports, but a trade between the division rivals is unlikely. Rosenthal noted earlier today that Washington also has interest in Asdrubal Cabrera. The Orioles have checked in on Bartolo Colon, reports Jon Heyman of CBS Sports. However, the Mets aren’t sure whether or not they’ll trade him at this time yet. The Mets have signaled a definite willingness to move Colon, though GM Sandy Alderson isn’t one to simply dump salary in trades, so based on Heyman’s writing, it seems that the O’s probably haven’t made any form of significant offer. There’s no traction between the Royals and the Mets for Colon, tweets Andy Martino of the New York Daily News. Martino adds that barring a change, the Mets don’t seem likely to be active today, but he’d be surprised if Colon were with the Mets in 2015. Sherman also hears that the Mets are likely to stand pat today (Twitter link). The Mets feel that a better market will develop for Colon in the offseason, when he’ll have just one year and $11MM remaining on his contract. The Twins plan to hold onto Josh Willingham through the trade deadline, reports Mike Berardino of the St. Paul Pioneer Press (via Twitter). Minnesota could, however, deal the outfielder over the August waiver period. Willingham, 35, had been said to be a possible acquisition target of several clubs looking for right-handed pop from the corner outfield. Though he has only a .222 batting average on the year, he has reached base at a .363 clip and slugged a respectable .422 (though that latter figure is well off his career .468 mark). The veteran is earning $7MM this season in the final leg of a three-year pact. The Royals are in the market for a right-handed hitting bat to play right field, but ESPN’s Jerry Crasnick reports that the team isn’t in on Boston’s Jonny Gomes or Minnesota’s Josh Willingham (Twitter links). Additionally, Crasnick tweets that he isn’t sure the Royals view Chris Denorfia and Justin Ruggiano as upgrades over Justin Maxwell, who is hitting well in Triple-A. The Royals don’t feel that Gomes is capable of handling right field, and the same applies to Willingham as well. (As Crasnick notes, Willingham’s July swoon hasn’t helped his value.) Crasnick hears from one AL executive that the Twins would very much like to move Willingham, but they’re simply not getting much interest at this time. Gomes, Willingham, and Denorfia are all free agents at season’s end, while Ruggiano would remain under team control via arbitration. The Royals were said at one point to have interest in Marlon Byrd, but a report yesterday indicated that they were backing off both Byrd and Alex Rios. The Royals are on Byrd’s limited no-trade clause, and he’d reportedly like the Royals to guarantee his $8MM option for 2016 in order to waive that clause. If you’re wondering who else could be available, MLBTR’s Charlie Wilmoth recently took a look at the trade market for corner outfielders. The Cardinals are in need of a starter for Saturday, and manager Mike Matheny says that it could go to an arm that is not currently in the organization, as Derrick Goold of the St. Louis Post-Dispatch reports. Philadelphia has sent a scout to watch the Cardinals’ top minor league affiliate, Goold adds. As he indicates, it is easy to see the Cards showing interest in the Phillies’ Cole Hamels given his high-end talent and extended team control. On the other hand, a recent report suggests that the Phils have yet to go very far down the line in discussing Hamels, and the club is said to be looking for an overwhelming return to part with the lefty. For the Marlins, the desire to add a top-end starter does not mean that the team will part with any core MLB players, including outfielder Christian Yelich, reports MLB.com’s Joe Frisaro. Additionally, Miami remains more interested in adding an arm that it can control past this season. The club therefore might be more inclined to pursue John Lackey than Jon Lester from the Red Sox, and would have “heavy interest” if David Price of the Rays were to be made available. Frisaro says the club is working hard to make one or two deals by the trade deadline. The Mariners are currently discussing outfielder Josh Willingham with the Twins, sources tell Jon Morosi of FOX Sports (Twitter link). The sides were connected a few weeks back by Jon Heyman of CBSSports.com, and Seattle has long been said to be seeking a right-handed bat for the outfield. Also still in the mix on Willingham are the Yankees, among other teams including Seattle, reports Heyman. Dodgers outfielder Matt Kemp interests the Red Sox whether or not he would be involved in a hypothetical deal for Lester, reports Gordon Edes of ESPNBoston.com (Twitter links). Boston has scouted him on and off over the last month, says Edes, and would consider adding him over the offseason if nothing comes to pass this summer. The Rangers are working to deal outfielder Alex Rios, a source with a team interested in a bat tells Andy Martino of the New York Daily News (Twitter link). Rios, who was off to a hot start, struggled mightily in June and but has improved to a .304/.317/.405 line for the month of July. White Sox reliever Matt Lindstrom is nearing a rehab stint, MLB.com’s Scott Merkin reports on Twitter. The 34-year-old owns a 3.32 ERA through 19 innings, and could be a possible August trade chip if he can return healthy. He is playing on a $4MM salary this year before hitting the open market.